GLOBAL AWARENESS 101 - Let your VOICE be heard and get involved. OUR future depends on it! : LAOS: This Laos Resort Serves Rich Tourists Tiger Meat and Fresh-Killed Bear Cubs. Bear's Are Killed For Only Their Paws. LAOS: This Laos Resort Serves Rich Tourists Tiger Meat and Fresh-Killed Bear Cubs. Bear's Are Killed For Only Their Paws. No matter where you go on Earth, the rich are subject to all kinds of buyable privileges that seem outlandish to the common person. It could be something as simple as paying $450 for a bottle of Smirnoff that would otherwise retail for less than a tenth of that price while trying to live large in a nightclub, or as lavish as hopping on a caviar-stocked private jet to an island resort. But in Laos, the wealthy have other decadent means of blowing their cash—and an investigative report has revealed that they’re extravagant in very controversial ways. According to a new report from the Environmental Investigation Agency, numerous ritzy resorts in the Southeast Asian country have been capitalizing off the sale of exotic meats and specialty food items. We’re not talking Wagyu beef here, either; this is a veritable smorgasbord of endangered species and other illegal game, from tiger bone wine to pangolins to bear paws. There are gift shops with names such as Golden Triangle Treasure Hall and Fantasy Garret displaying tiger skins, stuffed tigers, ivory tusks, rhino horn shavings (which are sometimes snorted or added to beverages), and leopard skins, as well as restaurants advertising “sauté tiger meat,” pangolin, and snake dishes. When pressed, vendors told EIA investigators that their suppliers were local tiger farms, or even admitted that they were illegally trafficked in from other neighboring countries—knowing that there would be few or no repercussions. Perhaps the most egregious business in the block is a restaurant called God of Fortune, which specializes in yewei—a Chinese term for exotic meat that translates to “wild flavor.” There, undercover investigators observed the sale of bear paw, turtle, Tokay gecko, and snake; jars upon jars of (purported) tiger bone wine; and visible cages containing live pythons and bear cubs, which the staff said could be killed and served upon request. A nearby “zoo” is populated with dozens of bears and tigers—making it no secret that its “attractions” will eventually turn into meals for the hungry tourists. The EIA points out that tigers, with a wild population of only a few thousand, are “perilously close” to extinction, and the bear trade in Laos has been on the rise in the past few years due to increased demand for bear bile—valued for medicinal applications in China, Korea, Laos, and other nearby countries. 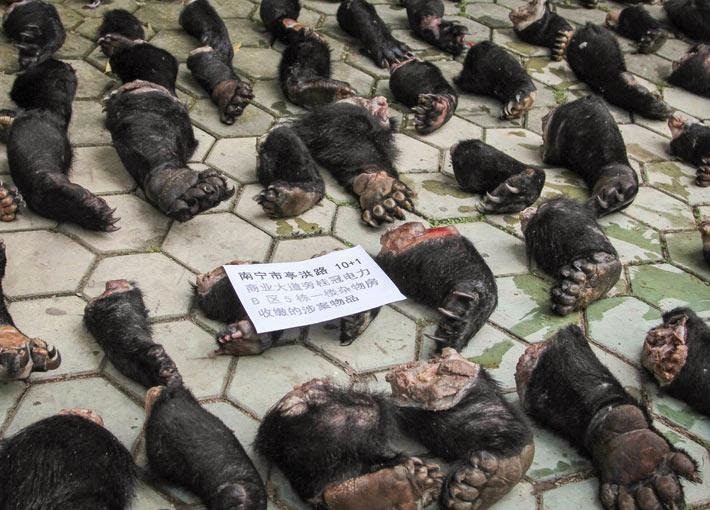 Current laws permit the trade of second- or further generation bears that were bred in captivity, but the “lawlessness” of the GT SEZ creates an environment that fosters illegal breeding, trading, and capture of animals. The EIA and other conservation and animal welfare groups stress that these types of businesses and tourist zones send a confusing message to consumers, implying that the consumption of these animals is legal and acceptable. Laos has been under pressure for years to tighten its restrictions on illegal wildlife trade and put an end to its inhumane bear bile farms, which have only been a growing problem due to rampant smuggling of the specialty product overseas. But with the money pouring in from tourists in areas such as the GT SEZ, it’s hard to clean up the trade without ruffling feathers. These bear cubs, tigers, and other animals will only make their way out of Laos’s Sin City if the demand for them diminishes—and when the cash stops flowing.